myReplay is an audio cart type app with 5 sound playback hotkeys. Each hotkey has control over its own load to add a song from your iPod library, control the volume, pan: center, left or right, rate: the speed of the song, inf. 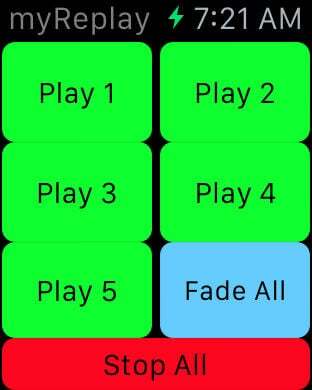 loop or single play, and a pause or start from beginning of the track option. When you touch the word "Pan" it will set the pan to center, left or right. When you touch the word "Rate" it will reset the rate back to normal speed.